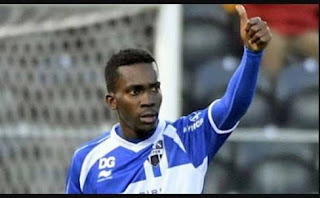 Nigeria international Henry Onyekuru is delighted to have been named Belgium's 'Promise of the Year' at the Golden Shoe Awards in Brussels following an impressive performance with Anderlecht in the first half of the Belgian League season. The 20-year-old winger, who is currently on loan at the Belgian club, joined English Premier League outfit, Everton from KAS Eupen in a five year deal worth £7 million and scored 9 goals in 19 appearances in all competitions for the Purple & White. Onyekuru beat the brightest young player in the Belgian Jupiler League to the award. He edged out Oostende forward Landry Dimata, and KV Mechelen’s Hassane Bandé to pick up the award. He has expressed his appreciation to his family and all the clubs he has played for in his professional career, saying they gave him their platform to become a better footballer. Since he was unavailable to pick the awards due to his knee injury recovery process, his teammate Leander Dendoncker received the award on his behalf. "Sorry I'm not there tonight. I want to thank everyone for bringing me where I am. My family too. In addition, I also owe much to the Aspire Academy and Eupen. They gave me the opportunity to grow," he said. "And Anderlecht obviously cannot be forgotten. I hope to see you back on the field soon. I miss you."